PANTONE’s 2019 color of the year—‘Living Coral’—is meant to be a symbol of buoyancy, warmth and nourishment in the thick of confusing times, but it has been widely criticized for incorrectly depicting the marine ecosystem. An Australian duo isn’t just scoffing at the “tone-deaf and downright irresponsible” hue that is trending globally, but it is also proposing a truer-to-picture swatch that the color authority might want to highlight the following year. 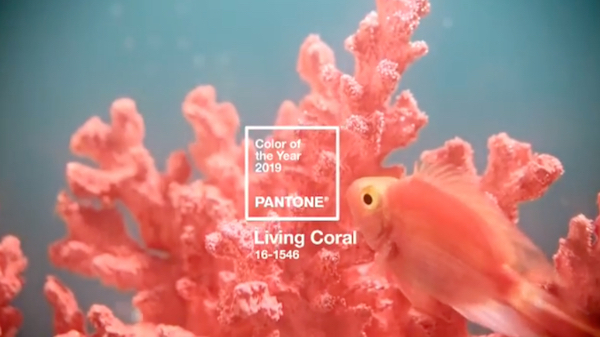 Art director Huei Yin Wong and copywriter Jack Railton-Woodcock from design studio Jack and Huei have drawn from PANTONE’s swatch library to identify a color most representative of the destruction of coral reefs, based on pictures of dying coral published by the Australian press. They came across ‘P 115-1 U’, which they now label ‘Bleached Coral’. The two now suggest that the pale blue tint should be PANTONE’s 2020 color of the year, as it matches the “unprecedented mass coral bleaching in the Great Barrier Reef, the largest living organism in the world,” they tell Dezeen. The coral owes its vibrant pink-orange hue and 90-percent of its energy to the colorful zooxanthellae algae that live in its tissue. The rise in water temperatures has threatened the lives of the algae. Without them, the coral tissues turn transparent, resulting in a phenomenon known as bleaching that reveals the white skeleton underneath. If the warm temperatures persist, the coral are at risk of death. “The color [of the year] is meant to guide, inspire and shape the world of design (and beyond), while reflecting the state of the world as we know it—the rich tapestry of an entire year, distilled into a single color,” they explain. A creative duo has proposed an alternative to the 2019 #Pantone Colour. The "Bleached Coral" colour draws attention to the #environmental crisis, in some regions 70% of the #coral is already dead.